Customize your trip with a local travel expert in Thailand. However Bangkok wasn’t always the busy, cosmopolitan hub that it is today. In fact Bangkok started out as a small trading post in the 15th century which eventually grew into Siam’s (as the Thailand used to be known) capital. The city further flourished in the 1960s, as well as during the Asian investment boom of the 1980s and 1990s. Now one of the world’s top tourist destinations, Bangkok attracts over 15 million tourists each year. And for good reason. But with so much to do, it can be hard to figure out how to spend your time. 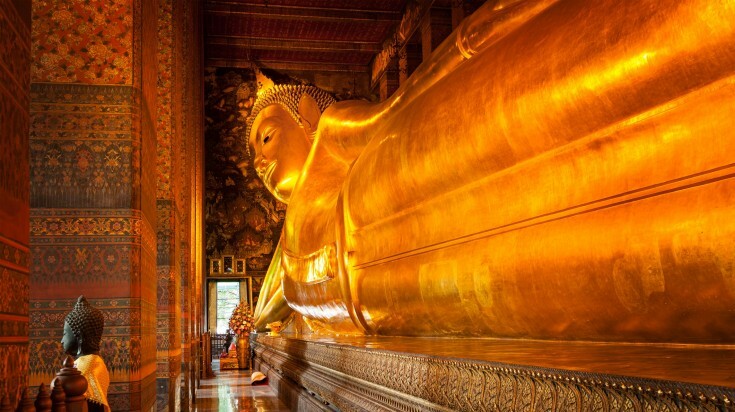 To make things a little easier we’ve listed our top ten things to do in Bangkok. Wat Phra Kaew, or temple of the Emerald Buddha, is regarded as the most sacred Buddhist temple in Thailand. 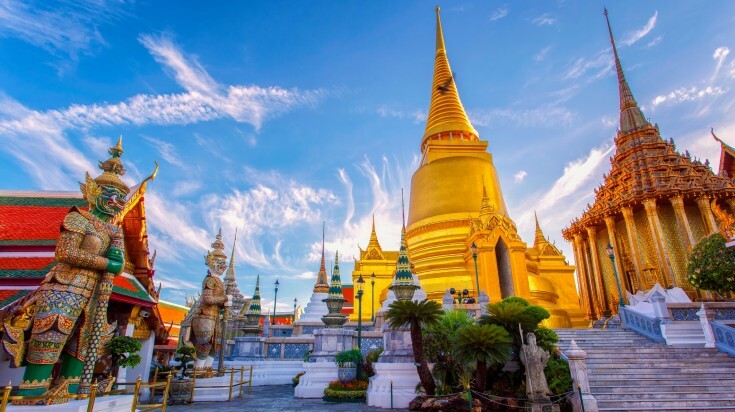 Built in the historic centre of Bangkok, the temple is home to the Phra Kaew Morakot (the Emerald Buddha), an image of Buddha precisely carved from a single block of jade. The image depicts Buddha meditating in the style of the Lanna School northern Thailand. Legend has it that the Emerald Buddha was discovered when Wat Phra Kaew was struck by lightning in 1434, and the octagonal Chedi fell apart, revealing the Emerald Buddha. Interesting Fact: The robe “worn” by the Emerald Buddha is changed three times a year by the King of Thailand himself. Wat Pho, or Temple of the Reclining Buddha, is a Buddhist temple located in the Phra district. Covering 80,000 square metres, Wat Pho is one of the largest temples complexes in Bangkok, and is perhaps most famous for its 46 metre long gold leaf plated statue of Buddha. However, though the statue is, without doubt, incredible, it’s certainly worth taking time to explore the rest of the complex, which contains over a thousand images of Buddha, a Buddhist monastery, and numerous statues of Chinese giants whose job it is to protect the temple. Interesting Fact: Wat Pho is the birthplace of the traditional Thai Massage, and a massage school operates to this day within the complex. Bangkok comes alive at night, which is why the Bangkok night bike tours are such a great way of seeing the city. Departing after sunset, these tours take riders off the beaten track, down back alleys and quiet lanes, around beautiful temple complexes, and usually to the famous flower market – which is always at its busiest during the night. Interesting Fact: Though Thailand’s capital is known all over the world as Bangkok, its actual name is Krungthepmahanakhon Amonrattanakosin Mahinthara Yutthaya Mahadilok Phop Noppharat Ratchathani Burirom Udom Ratchaniwet Mahasathan Amonphiman Awatansathit Sakkathattiya Witsanukamprasit. Wow! Bangkok was not always the Thailand’s (or Siam’s) capital. In fact neighbouring city Ayuttaya was the country’s capital until it was destroyed by the Burmese in the 18th century. 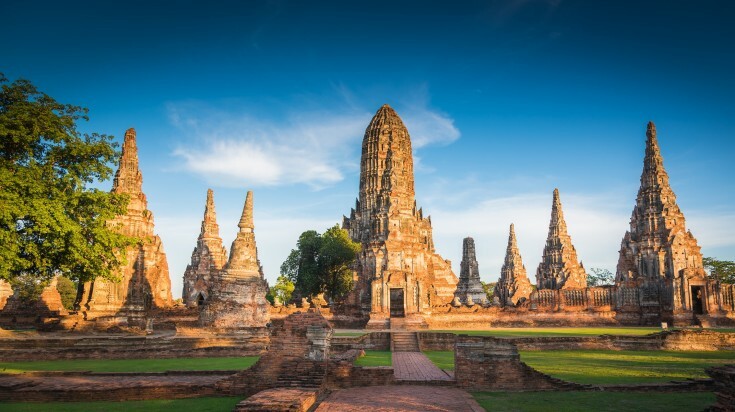 Today the ancient city’s ruins are preserved at the Ayutthaya Historical Park. 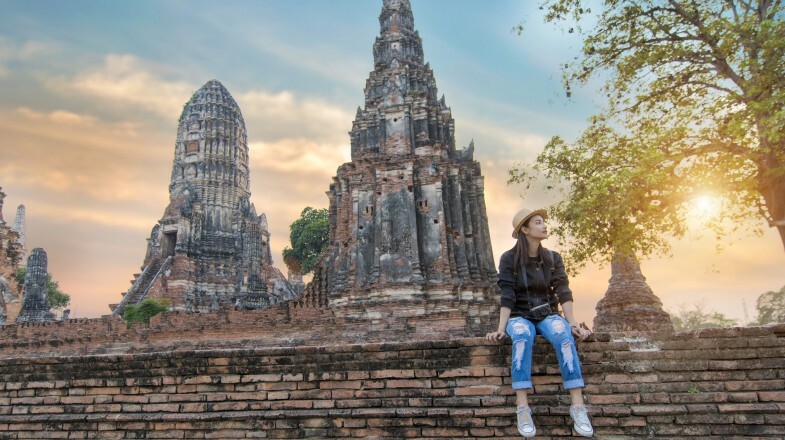 Recognised by UNESCO as a world heritage site, the Ayuttaya ruins cover a 289 ha area and contain distinctive reliquary towers, Buddhist monasteries, and plenty of other buildings of historical interest. Interesting Fact: At its peak, Ayuttaya was one of the most technologically advanced cities in the world, and even contained a hydraulic system for water management. 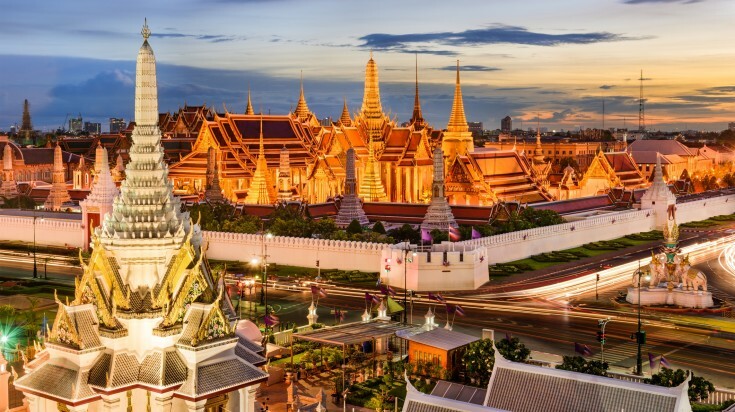 As iconic as it is beautiful, the spectacular Grand Palace is without doubt Bangkok’s most famous landmark. The Grand Palace was built in 1782 and was, for 150 years, home to the Thai King, the Royal Court, and the administrative seat of government. A real testament to the country’s creativity and craftsmanship, the Grand Palace dazzles visitors with its beautiful architecture and intricate details. Interesting Fact: Each of the Grand Palace’s 12 majestic gates has its own rhyming name. Bangkok’s BTS Skytrain started operating in 1999. The city’s rapid growth, combined with little urban planning and few building regulations, resulted in Bangkok growing into a jumbled, complex cityscape (which is really part of its charm). To allow people to navigate this urban maze more easily, the BTS Skytrain was built. The Skytrain is an elevated rail network and as such afford riders great views of the city beneath them. 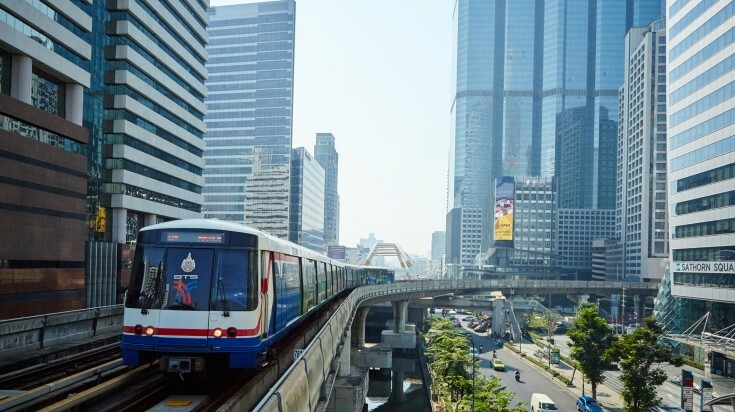 Interesting Fact: The Bangkok Skytrain was designed using the successful Vancouver Skytrain as a model, and was originally referred to as the Lavalin Skytrain. 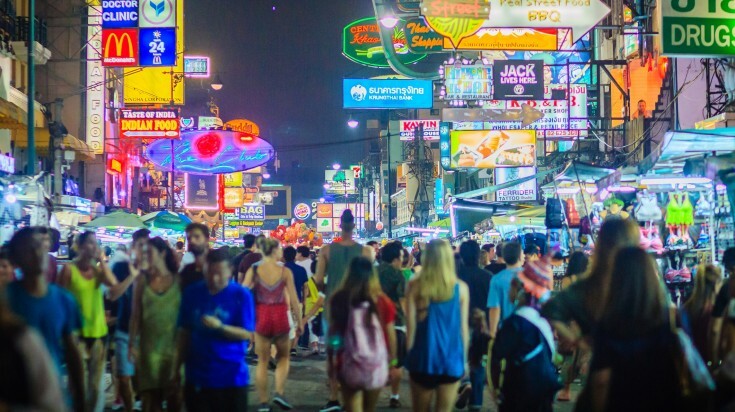 Khao San Road is a short but lively street in the centre of Bangkok. A “backpacker’s haven”, the road transforms from a fairly normal tourist area into, as soon as night time falls, an energetic street with bars, live music, food hawkers, parties, and night clubs. The road has been described as “a short road that has the longest dream in the world”. Interesting Fact: Khao San translated means “milled rice”, a homage to the street’s history as a major Bangkok rice market. Jim Thompson, born 1906, was an American businessman who was instrumental in helping to revitalise the Thai silk industry in the 1950s and 1960s. In fact his work was considered so important that he was described by Time Magazine as “almost singlehandedly saving Thailand’s vital silk industry" from extinction. 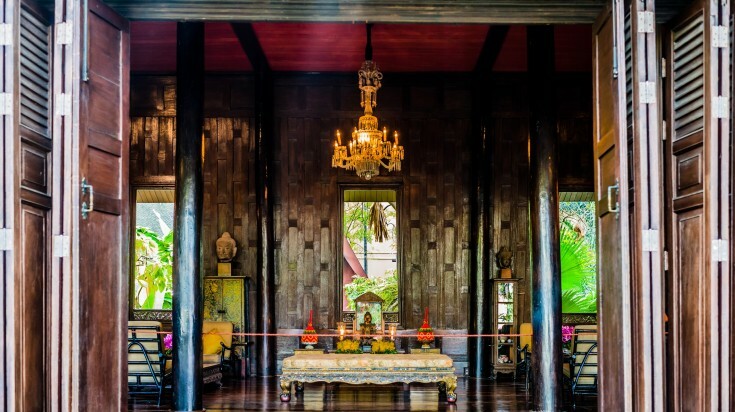 Today interested tourists can visit his house, now a museum, that houses an assortment of old Thai structures that Jim collected from all across Thailand. Interesting Fact: Jim Thompson mysteriously disappeared after going for a walk in 1967. Though no one really knows what happened, several theories have been advanced, including that he was captured by aborigines. 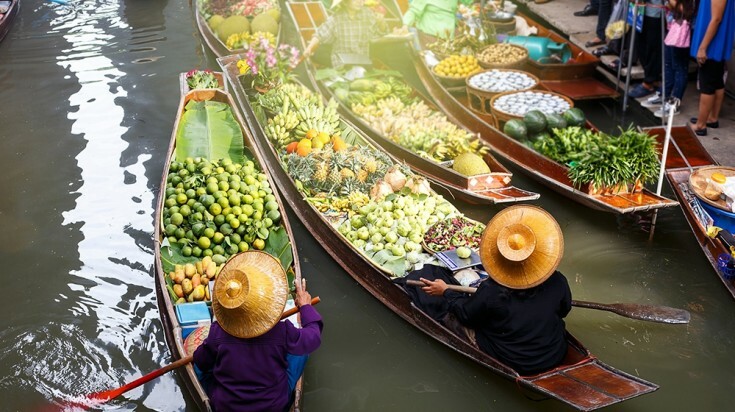 The visiting the floating markets in Thailand is a must for all travelers. Damnoen Saduak, the floating market, consists of dozens of wooden rowing boats bobbing up and down alongside each other, each laden with fruits, vegetables, flowers, condiments, handicrafts, souvenirs, and other assorted merchandise. Some of the boats are even equipped with cooking apparatus, giving market-goers the opportunity to enjoy freshly prepared “boat noodles” or seafood skewers. Interesting Fact: The Damneon Saduk floating market was featured in James Bond film The Man with the Golden Gun as the setting for an exciting chase scene. Seated on the bank of the Chao Phraya, the Wat Arun dominates the local skyline. 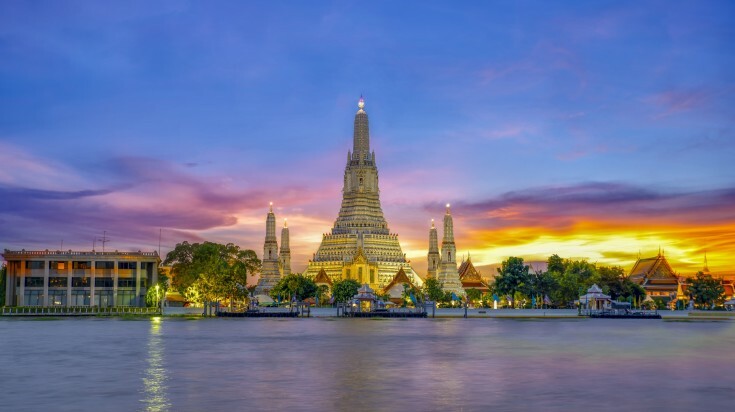 Perhaps one of Southeast Asia’s most recognised sites, the impressive silhouette of the Wat Arun features on countless Bangkok postcards and adverts. Towering 70 metres, Wat Arun’s spire, or prang, is decorated with tiny pieces of coloured glass and porcelain. Interesting Fact: Wat Arun symbolises the birth of the Rattanakosin period and the founding of the new capital after the fall of Ayuttaha fell. Bangkok is a unique city, and those who visit it will each have their own adventures and escapades. But endeavor to see our top ten things to do in Bangkok, and you can be sure that you won’t miss out on what Thailand has to offer.